Travis Apgar has a mission – to abolish hazing. Sharing his own personal experiences, he’s speaking on campuses to inspire others to help end hazing once and for all. It is Travis’ belief that as a student affairs professional he has a responsibility to get involved in the fight against hazing, and to help provide resources to professionals and students that can help get the job done. Travis is an Assistant Vice President & Dean of Students at Rensselaer Polytechnic Institute. He holds advanced degrees in psychology and education administration and has received national recognition as an outstanding student affair professional. 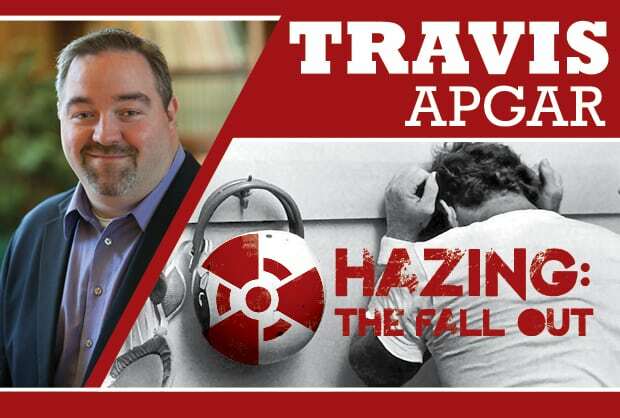 Educator, writer, and consultant, Travis has been a featured speaker on college campuses and at conferences across the country, working with thousands of students, faculty, administrators and coaches with the goal of putting a stop to hazing. Considered an authority on hazing prevention, he has contributed to the National Hazing Prevention Week Resource Guide, assisted with the development of the NCAA Hazing Prevention Handbook, appeared in Haze, a documentary released by the Gordie Foundation, and on PBS NewsHour and HuffPost Live. It was fantastic seeing so many @ualbanyalumni and colleagues in LA for #NASPA19 ! Thank you for hosting @MikeChristakis for hosting. As a first generation college student, Travis went off to school not knowing what to expect. The chance to attend college came as a result of his abilities as a high school football player, and when summer camp opened for the football team he was among the first to get the “rookie treatment.” The only thing worse was his fraternity pledging experience. Travis left college after his first semester, before the school had the chance to kick him out. In his keynote, Hazing: The Fallout, Travis tells his story of the pain and hidden harm caused by his hazing experiences. Travis went on to complete his college career at another institution, and today is the Associate Dean of Students at Cornell University in Ithaca, NY. Hazing: The Fallout, is a fresh, new look at hazing from the perspective of a victim with a background that contributed to the severity of the impact. Travis’ emotional and powerful story is the perfect way to give your students a wake-up call about the hidden harms of hazing. ways they can help stop hazing.